Many people are still blind to the fact that their own town is following the tenets and recommendations of the UN’s Agenda 21 or Agenda 2030 as it’s now called. They don’t understand how this agenda could have gotten from ‘there to here’. The UN takes under its wing, many benign sounding private organizations such as the Girl Scouts, American Planning Association, Rotary Club, libraries, and AARP… It somehow gets them to accept and promote the “sustainable development goals” (SDGs) and merging local governments into regional, political subdivisions led by unelected individuals. Your town, if involved in a “regional planning commission”, then “partners” with these benign sounding groups, as was recently done in Bedford with AARP. Voila, the agenda is installed. 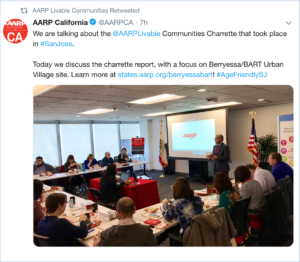 Here is proof that AARP, which is supposed to be a group for seniors, is now engaged in transforming local politics so that towns and counties can be merged with regional governments and global mega-cities. This entry was posted in Federal, International, Local, Miscellaneous, State on January 24, 2019 by GSF.